DHFL Pramerica is a renowned life insurance company which is a partnership between DHFL Investments Ltd. and Prudential International Insurance Holdings Ltd. The life insurer has the backing of two well-established financial services organisations with a history of excellence in business over many decades. At present, the company has a total of 126 branches and has reported to have Rs.4,184.22 crore worth assets under management. The company boasts of having secured over 22 million lives so far. The life insurer offers protection plans, savings plans, health plans, child progress plans, and online plans for individuals. The company also offers a separate group life insurance plan for employees. 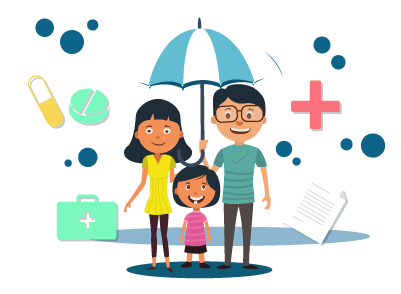 The life insurance premium is a nominal amount that the person who holds the policy is required to pay so that the insurer can protect his/her family’s future if the individual is not around. The premium amount depends on a number of factors such as the sum assured, the age of the policyholder, and so on. While the benefits offered by a plan are of utmost importance, the premium payable could be one of the deciding factors at the time of purchase of the plan. This is when the function of the premium calculator steps in. The premium calculator, available on the official website of the life insurance company, gives an estimate of the premium a person has to pay towards the policy. Select the policy you wish to purchase from the drop-down menu’s ‘Life Insurance Plans’ or ‘Online Plans’. On the redirected page, find the ‘Calculate Premium’ icon on the red-coloured tab. First, fill in the policy particulars – name of the policyholder, gender, e-mail, mobile number, date of birth, and age. Write the proposal number if any. Continue filling the sheet and select each of the options, under ‘Base policy information’, as per your preference. A few of the options may be disabled. You can enable it by clicking on the switch that says ‘No’ which will automatically turn green and indicate a ‘Yes’. You can then enter the necessary details. Once you are done entering all the details, click on ‘Calculate’ to see an estimate of the premium amount payable. Helps determine the premium: The tool will specify how much you have to pay towards the policy. This will help you decide which plan you need to purchase. Helps compare products: You can conveniently differentiate between policies based on prices. You can decide if you want to buy a policy that is priced low but has many features or a plan that has only a few but significant benefits and is priced high. Saves time: The procedure to find the premium estimate does not take too much time. You can save on time and effort taken in visiting a branch office of the insurance company or calling up a customer care executive. It will take only a few minutes to check the premium payable online for various plans. A life insurance policy is a very important financial product that every earning individual, who has dependents, should invest in. The points stated above proves that the premium calculator is a beneficial tool that any prospective life insurance policy buyer can consider using to find out how much he/she has to pay towards the policy. If you plan to buy a life insurance from DHFL Pramerica, follow the steps elaborated above to find out how much you should pay as the premium.